Looking for something fun and exciting with some wind in your face. Then the Epic VISTA Ride is for you. 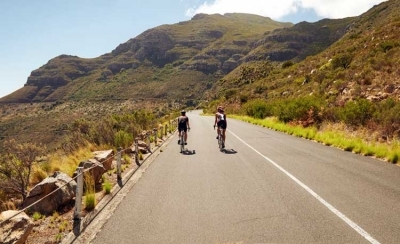 At a little bit of a more relaxed pace than our Epic Explorer and Epic Road rides, the Vista Ride will have a bit more leisure with a few more stops. Enjoy the gentle pace while taking in the beauty of the surrounding lakes and vineyards while our amazing guides show you the way. Stop at the vineyards to enjoy the local cuisine and wine tastings while on your route. Panoramic opportunities for pictures and memories for a lifetime await you. Support vehicle with water and snacks included. The Peach at Lake Shore Drive OR Skaha Lake Park – cross streets are Cypress Street and Elm Avenue, in front of the pink Tickelberry’s ice cream shop at the far east side of the lake. Once you purchase, we’ll send you a confirmation within 24 hours. 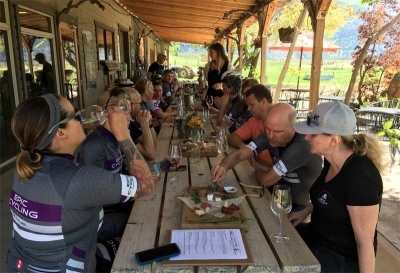 Then 14 days prior to your ride, we’ll email you meeting point, start time, and anything else you need including maps and wineries. Don’t leave the South Okanagan without seeing it by bike. Just a friendly reminder that although we’re big supporters of any type of riding, Epic Cycling is for road cyclists so bring your road bike only please. Please be responsible on your ride and at the wineries. You can read more about what’s expected of you in the FAQ section and our rider code of conduct. Book your ride! Choose your date and click to purchase. If you have any questions at all, feel free to contact us.